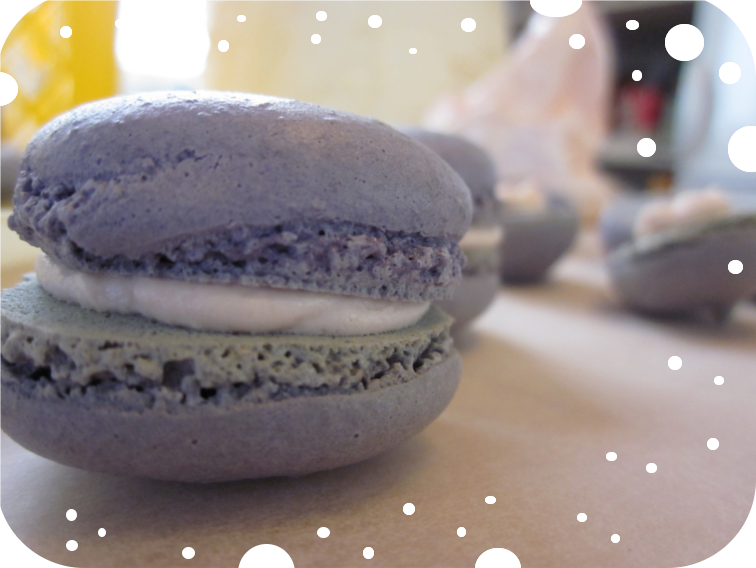 I have tried to make macarons once before...and well...they didn't turn out so well..But this time, oh my gosh, let me tell you! They were close to perrrfection! The original recipe can be found from Not So Humble Pie and there's also a Finnish version at Jauhot Suussa. The macarons that I made were the Italian version. a scale, a thermometer, pastry bag/piping bag (you can always use a plastic bag - just cut off one of the corners. But be careful not to cut a too big hole..better to start with a small one) lots and lots of little bowls. 1. Take out the egg whites and let them cool to room temperature. Sift the almond flour and the powdered sugar in a bowl and set aside. 2. Measure 60g of the egg whites to another bowl and measure also 35g of the granulated sugar in small bowl and set aside. 3. Leave the rest (60g) of the egg whites to wait for its turn. 4. Take the remaining 150g of the granulated sugar and put it in a small pan, add the 50g of water. Now you need the thermometer! Place the pan over medium heat and set the thermometer so that it will alarm you when the temperature reaches 110 C (230 F.) The is no need to stir the syrup. 7. Now mix the remaining egg whites (60g) into the almond flour and powdered sugar mixture. Also add the color at this point if you are planning to use coloring. 8. Now fold in the cooled meringue to the almond/sugar/egg white/coloring paste mixture with a spatula. Use as few strokes as possible! The batter will get thinner with each stroke. The batter is ready when you lift your spatula and a thick ribbon slowly cascades off back into the bowl. 10. 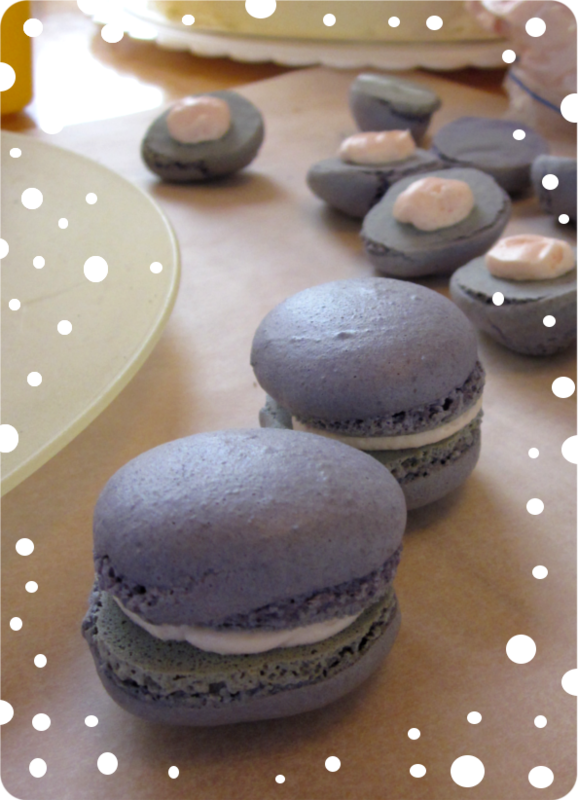 Let the macarons be for about 15-30 minutes before putting them into the oven. 11. Bake at 160C (320F) for about 14 minutes. For filling you can use sooo many things! There are great recipes at Not So Humble Pie. I made the filling using this Marshmallow Fluff Icing Recipe (the amount in the recipe is for icing a cake so you'll have to only make like 1/3 or 1/4..) I also put some pink coloring in the icing ♥ cuute! After filling these darlings you should place them in a container and put them in the fridge for a day..I know...what madness after all that hard work! But They will taste sooo good the next day! But I totally understand if you want to eat them right here and now! I wish you all fun times making these sweeties! ..hmmm which colors should I use next time...and there are so many fillings to choose from...hmmm..